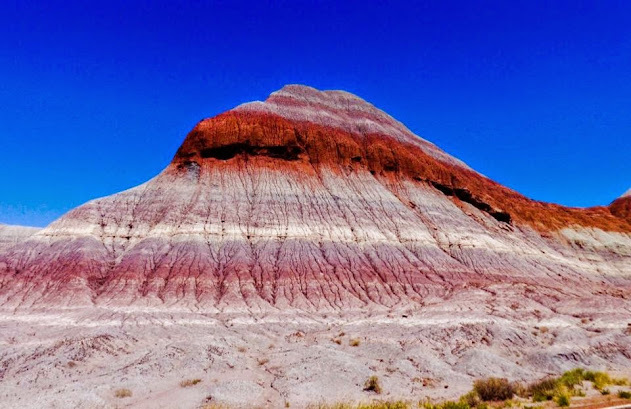 I spent the last two days hiking and driving around the Painted Desert and Petrified Forest in Eastern Arizona. Wow it was very spectacular. I saw some of the best desert scenery ever. 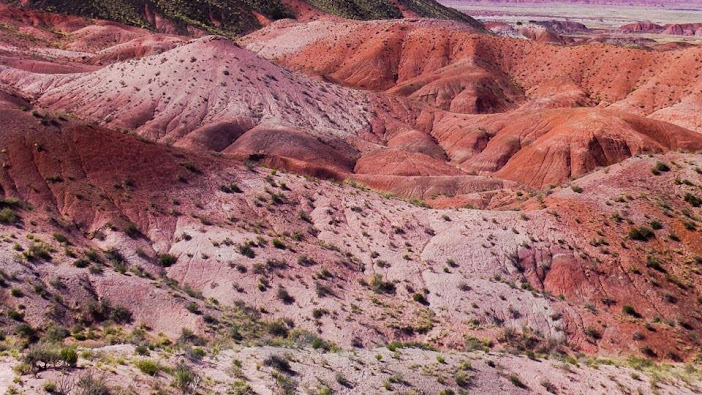 The desert there had so many colors and stripes, and whole sections were filled with vivid pink colors. 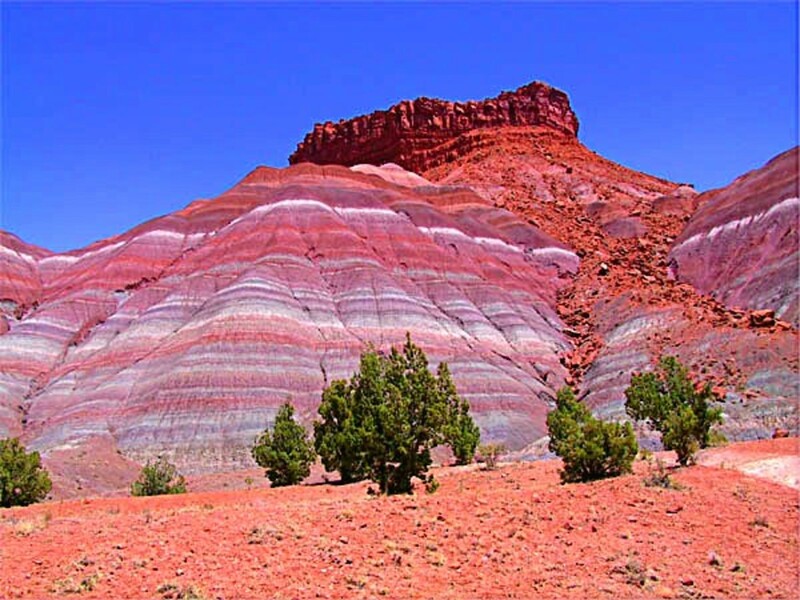 The Petrified Forest section was something I'd never seen before. 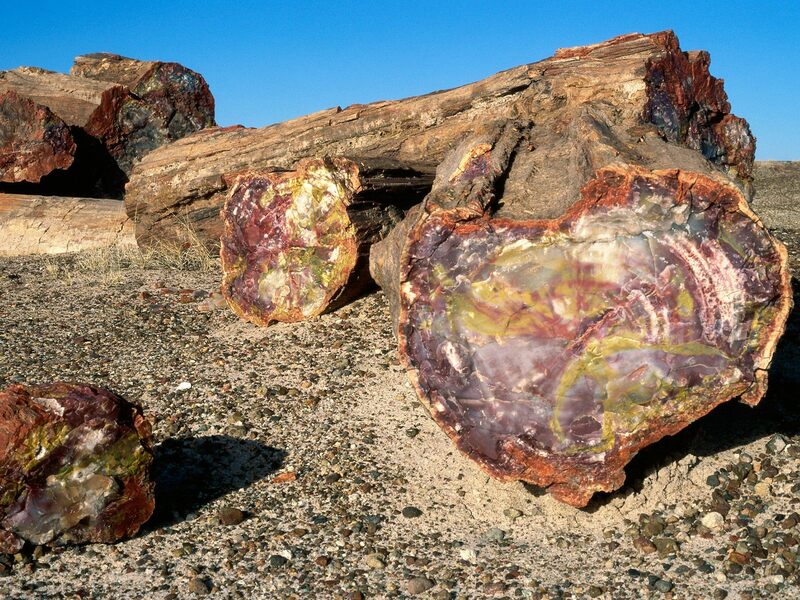 Logs and tree stumps were turned into rock crystals with kaleidoscope colors after millions of years. I never knew that wood could become crystals. 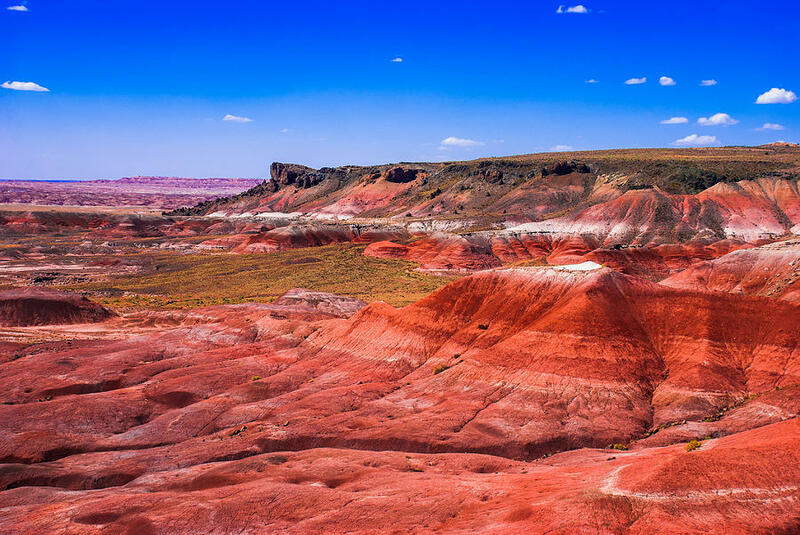 Millions of years ago, Arizona was a swamp land with dinosaurs. Then the trees went underwater and the area dried up. 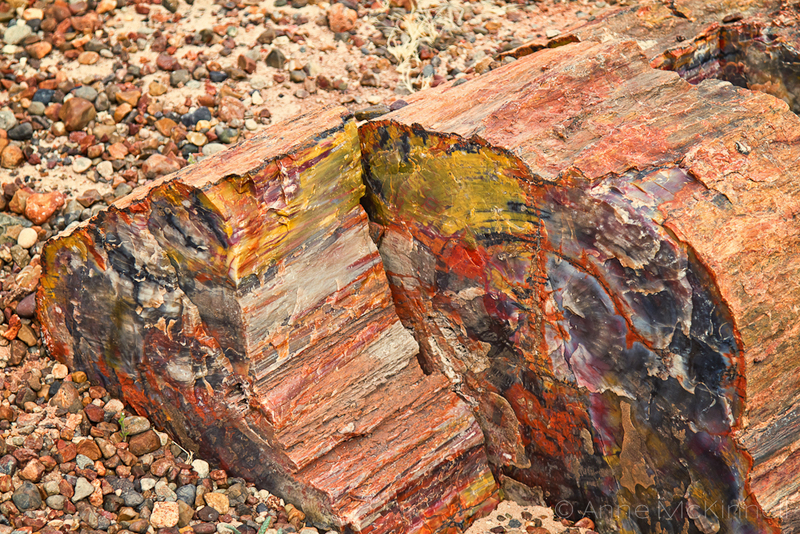 Silica water and other minerals turns the wood and trees into rock crystals with many colors. It was very fascinating and breathtaking. There was enough in that national park to see to fill up two days. I tried to see every part of it that I could. After two days of hiking and taking many photos, I was exhausted and sunburned yesterday. I slept 12 hours afterward at a motel. Today I'm resting inside the motel, since I'm still tired and it is very windy outside. Here is some more info about the park if any of you are interested. 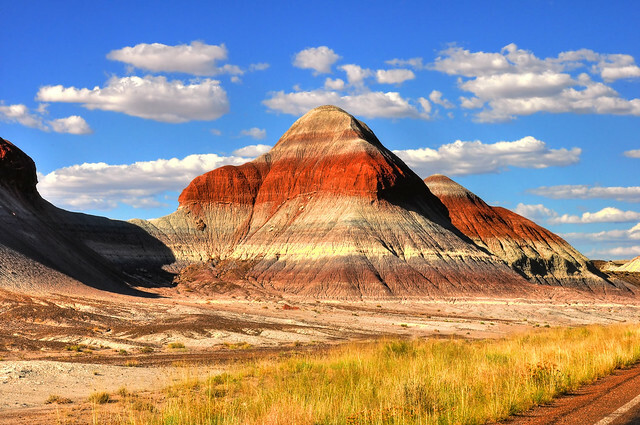 Logs at Petrified Forest that turned into rock crystal after millions of years. Last edited by Winston on May 30th, 2014, 10:17 am, edited 1 time in total. I noticed while hiking that the only people that will say hi to me are old people and little kids. Especially little kids under 5. Why is that? Why are the people between little kids and old people so much more paranoid, cold and business-like than those at either extreme? Even when you're young, it's hard to get along with young people for some reason. Also, why do many older people like to talk a lot and get long-winded? Have you noticed that sometimes when you just ask them one question, they yak on and on? Why do they do that? Is it because they are lonely and ignored, or because they have a lot of knowledge and wisdom to share, or both? I'm in New Mexico now in a small town in the southern part of the state. Last night I camped in the forest in the mountains along the Arizona/New Mexico border. The woods were beautiful with fresh alpine air. But the night temperature was very cold. I could not sleep and kept waking up many times. So I didn't get a good night's sleep at all and am tired from it. Are any of you in New Mexico? I also plan to head to Phoenix on the way back too. Do any of you live there? I just went to White Sands National Park today. The white sand dunes were nice, but very bright. You need sunglasses to go there. New Mexico is nice. Prices are a bit cheaper here than in the rest of the Southwest. The towns have a laid back vibe. The girls look relaxed and laid back too, especially the Mexican girls. However, the towns don't look modern. They look a bit ghetto and outdated. Do any of you live in New Mexico? Tomorrow I'm headed to El Paso, TX. I'll try to meet up with Fschmidt there. Yesterday, me and fschmidt went to Ciudad Juarez, Mexico, which was right across the bridge from El Paso TX. It was interesting, but it was a third world dump and very ghetto. Even the Philippines is more modern than that town. But the people were relaxed. If you looked at anyone, they would look at you back. They did not have that paranoid uptight vibe like in America. There was normal eye contact like in most foreign countries. The food we ate also tasted natural and less toxic than in America. The area felt safe too. There were cab drivers wanting to take us to brothels or whatever. But I didn't want to check them out because most likely they were gonna be dumpy too with no hot girls. A trip report in this forum seemed to indicate that too. fschmidt is a very intelligent, wise and sensible guy with a lot of knowledge and is no-nonsense. If any of you ever come to El Paso TX, you should try to meet up with him. Mr S was right when he told me that the southern New Mexico towns were dumpy. They are. The infrastructure looks old and worn and there's nothing to do. It's no wonder why there aren't any tourists in the area. Now I see why. 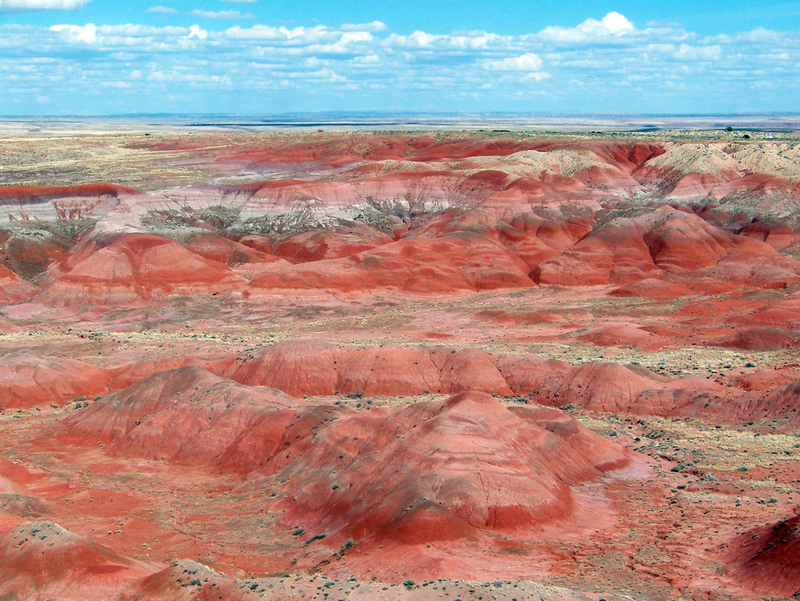 Plus the terrain in southern New Mexico is bland, not colorful or spectacular like in Arizona. That's why everything is cheaper as well. If you want to go to an upper middle class area, you gotta go to Santa Fe. The Mexicans in New Mexico look relaxed and laid back, but the white Americans in the area look the same as anywhere else in America. However, the hot Mexican girls here have that snobby unapproachable look. Only average looking women look friendly. 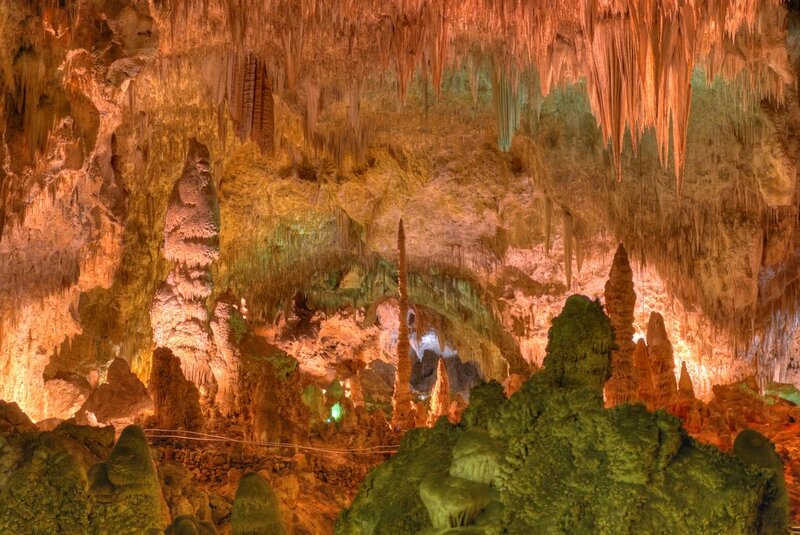 Today I'm headed back to New Mexico toward Carlsbad Caverns to see caves and bats. Then I'll head to Roswell to see the UFO museum there. 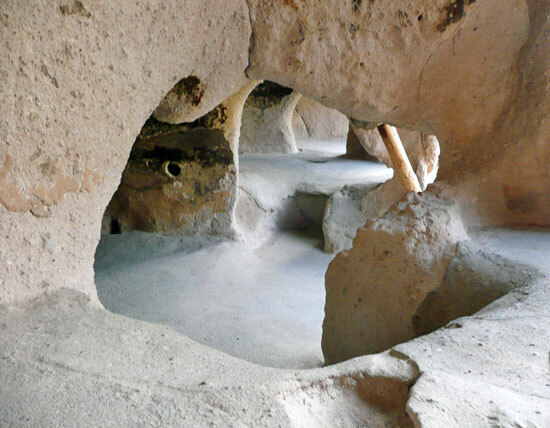 Then I'll drive through the forest to Albuquerque to see the Pueblo Cultural Center Museum. 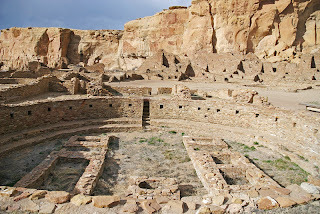 From there, I'll head to Chaco Canyon which reputedly has the best Native American ruins. I'll try to visit Los Alamos too. Then I'll head to Phoenix to visit a friend and maybe the AFA office too, which are our sponsors. Last edited by Winston on May 30th, 2014, 10:21 am, edited 2 times in total. 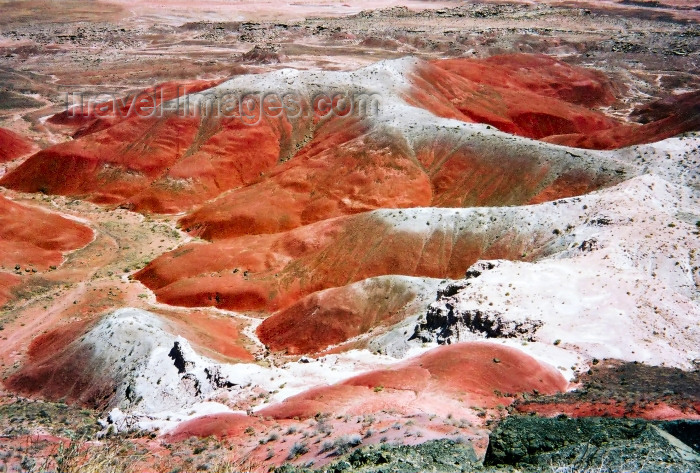 My friend Mitchell enhanced some of my photos from Painted Desert, AZ. Check them out below. They look more vivid now. Winston wrote: The Mexicans in New Mexico look relaxed and laid back, but the white Americans in the area look the same as anywhere else in America. However, the hot Mexican girls here have that snobby unapproachable look. Only average looking women look friendly. Yeah I saw plenty of 'Mexicunts' when I lived in San Diego. Again, tons of chumps behind them, they have plenty of choice, unless they're the heavy-set type. I met a super-hot 19yo (a friend's friend's cousin) that was really down-to-earth, but she was only visiting from veracruz or something like that of course. I'm in Carlsbad, NM now, which is in Southeastern New Mexico. The last two days I hiked in Carlsbad Caverns. It was very spectacular, but my legs are very sore. The next day, I went on a Ranger guided tour that was fairly easy with a large group. It was called the King's Palace Tour. Tomorrow I'm going on another guided tour called the Left Hand Tunnel Tour and then I'll head to Roswell after that. The rest of the tours are more demanding, strenuous and physically challenging, so I'm not gonna do them. The ones I'm doing are easy ones that even older folks can do. Here are some photos of the sites I saw in Carlsbad Caverns. The descent path into the cave. After you enter the cave, the descent path continues for another mile. It's a bit hard on the legs and feet. But you can bypass it by taking the elevator down from the visitor's center. 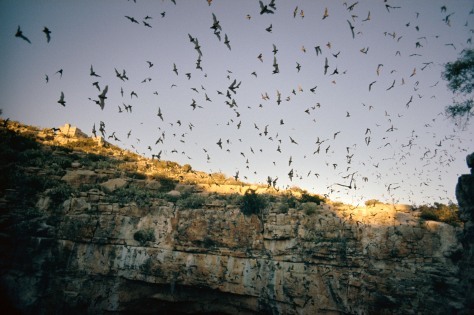 Every evening at sunset, thousands of bats fly out of the cave at Carlsbad Caverns to look for food. Visitors can see the bats flying out of the cave from the amphitheater above at the visitor center, but you have to show up at 7pm to see it. So far, I've been too tired from hiking the cave to drive all the way back at sunset to see it. The thing that's nice about US National Parks is that they tell you which trails and paths are easy and which are strenuous. In contrast, in the Philippines the travel sites don't tell you and don't even care. For example, the Filipino site www.visitsagada.com tells you that the caves in Sagada are great for exploring and spelunking. But they do NOT tell you that it is unpaved with NO trails, physically strenous and demanding, and dirty and slippery too. Definitely NOT for everyone, especially those out of shape, not athletic and older folks. You can even get hurt trying to climb that cave. But they don't tell you that. Not even the tour guides in Sagada tell you that! Sheesh. Instead when you arrive, you are in for a rude unpleasant surprise, as I was. Filipino sites such as VisitSagada.com are rude and inconsiderate in that sense. American sites are far more considerate about these things. But for some reason, Filipinos seem to be good at physically demanding stuff like traversing strenuous unpaved terrain, which they do with little or no effort. They are even naturally talented at climbing trees. I've seen them do it as though it were second nature to them. They can do it even WITHOUT practice or experience. Even Filipinos who stay indoors all the time can do it. It seems innate to them, like it's in their genes or something. Perhaps this is why they think such things are easy. Their mistake is in assuming that it's easy for everyone. Btw, the town nearby called Carlsbad is a dumpy town with lots of construction traffic and overpriced motels. The motels are overpriced because oil refinery workers stay there while working in the oil refinery. There are also construction vehicles driving by all the time with redneck type workers that have dirt all over their clothes. So the town is not very nice. 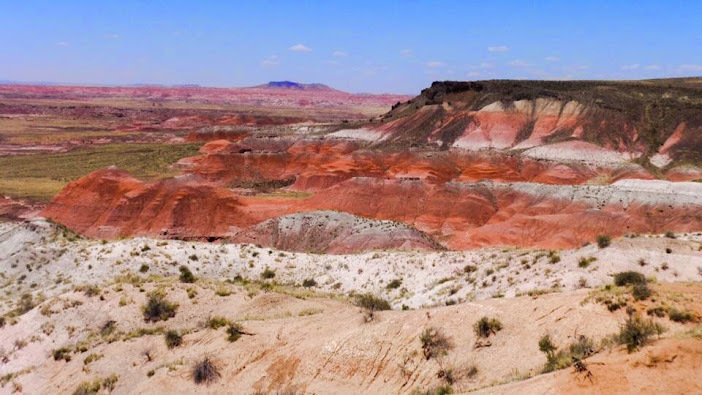 The lodging is overpriced too, for New Mexico, which has one of the cheapest costs of living in the country. I don't know why oil workers staying in that town jack up the price of motels there. 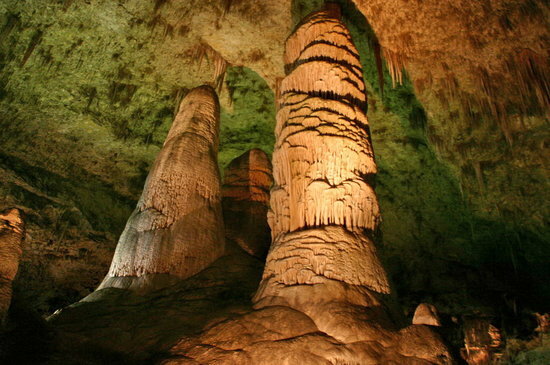 But the fact that the town is near Carlsbad Caverns probably has something to do with it as well. Last edited by Winston on May 30th, 2014, 10:22 am, edited 1 time in total. After my last tour in Carlsbad Caverns, I asked our tour guide if she was Native American. It turned out she was a young Mexican American. After that, we talked for a long time because we connected on the same wavelength and had similar views on everything. It was amazing and refreshing. I haven't connected with a girl like that in a long time, and I never met a Mexican girl that could relate to me so well. She was into writing too and felt the same way as me about life, people, getting away from cities, etc. It was a good feeling, and it made me realize how much I miss having a real connection with a girl, which I don't get in the Philippines. You see, in the Philippines, girls are very easy going and humble, resulting in no drama and no personality conflicts. However, a Filipina cannot really relate to me, understand me or have a deep connection with me. They are too simple and hardwired to be conformist followers, not truth seekers. So I've never enjoyed a deeper connection with them, which I've always missed and felt incomplete without. 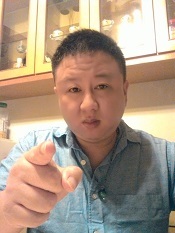 Some guys may not care about having a deeper connection with a woman, but I do, because I'm a deep and complex person, so for me it's a bigger issue than it might be for average guys who are not deep. Anyway, I gave her my email, so I hope she writes me sometime. Then I went to Roswell, the site of the famous alleged UFO saucer crash and cover up. But all there was there was a museum with info boards that told you the same thing you learned on websites. So you don't learn anything new there. But there is a research center library there with lots of books, documents, videos and materials you can research. When I arrived, there was a big thunderstorm, which they didn't have in years. I always seem to bring rare things like that to places when I arrive. I don't know why. When I go into houses and cars, things happen that people say have never happened before. Also, on the way to Roswell, a scary Murphy's Law event happened. I was having a peaceful drive when all of a sudden a long gas truck with two compartments pulled across the highway in front of me. I had to slam the brakes to avoid hitting it. Behind me was a white van tailgating me from close behind which was in danger of hitting me too. But I had no choice and had to slam the brakes. When I did, time seemed to slow down as I watched the long gas truck pass by. When I looked in the rear view mirror, I saw the driver behind me swerve to the side to avoid hitting me. Along the way west, I visited the town of Lincoln, where the infamous outlaw Billy the Kid broke out of the courthouse jail and escaped before being gunned down by Pat Garrett in 1881. There was a museum and exhibits there about the Lincoln County War and Billy the Kid. In the courthouse, you can even see the bullet hole that Billy the Kid shot into the wall during his escape. You can see the window where he shot another guy below too, and the chains he broke out of. There was also a nice Bed and Breakfast where I had a healthy lunch with a big Greek salad and scrambled eggs. Now I'm in the middle of New Mexico in the forest area in a very small town called Capitan that only has one short street. It's very nice, peaceful, cozy and quiet here. People are very friendly too. And the restaurant food tastes like home cooking. I love towns like this. They are great getaways for a while. So I decided to stay two nights. Earlier today when I was doing laundry in the laundromat here, I met this friendly perky blonde woman. Even though she had kids and was a single mother, she looked very fit, attractive and young. When the detergent dispenser broke, she drove me to the grocery store to get some. Small town people are cool and laid back like that. 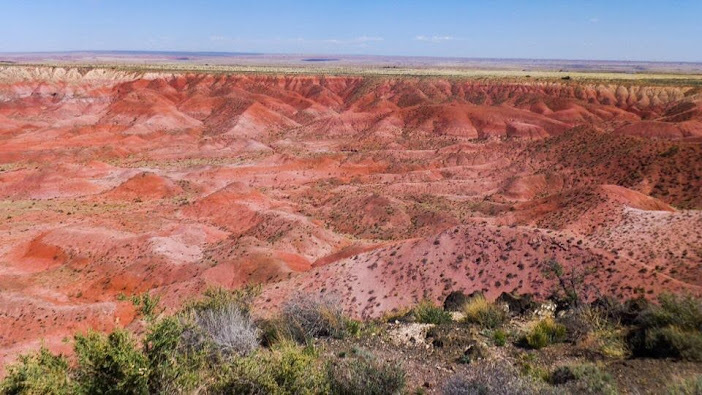 Tomorrow I'll head to Albuquerque to visit a Pueblo Indian museum and cultural center, Petroglyphs National Park, and try some vegan restaurants in the area that I found on HappyCow.net. Then I'll head to Los Alamos to see the science museum there and then to Chaco Canyon, which has some of the best Indian ruins that may have been the result of extraterrestrial contact and intervention, according to an episode of "Ancient Aliens" on the History Channel. Btw, earlier today when I went to the Smokey the Bear Museum in Capitan, NM, I looked at the info exhibits on the wall about forest fires. (the original Smokey the Bear mascot was found in this area) One of the exhibits said that there are two kinds of forest fires - man made and natural. It said that natural fires are started by nature to remove dead wood and overcrowding of trees too close together that lead to an unhealthy forest. That was kind of unusual. By saying that Mother Nature starts light forest fires to clean up the forest and depopulate the trees to restore balance to the forest, the exhibit was in effect saying that Mother Nature is conscious and alive, kind of like the Gaia theory that says that the Earth is a living organism that replenishes and heals itself just like any organism does. I've never seen a government exhibit say that kind of thing before and insinuate that Mother Nature is conscious and alive. Last edited by Winston on May 30th, 2014, 10:15 am, edited 1 time in total. Anyway, Albuquerque was a dump. Even the people who live there said they didn't like it much, and other New Mexico residents also said it wasn't a nice town. The downtown area was ok, but the area outside of it was dumpy and just a bunch of strip malls. There were so many depressed looking degenerates everywhere, which is common in American cities, and sad to see, isn't it? Why are US cities like that? The only good thing I saw there were many good restaurants. There were even three vegan restaurants on Central Ave near the University of New Mexico. One of them had a full scale vegan sushi bar, which was interesting and I had never seen before. They were very delicious. They have a Thai Vegan place, a Nu Asia Vegan Place, and a Loving Vegan Place. The Pueblo Culture Center there was not much to see. It didn't have that many exhibits, and most of it was simply highlighting modern life of the Pueblo people. The historical exhibit was small and not that noteworthy. The Petroglyphs National Park there was so so but the walk was terrible. On the trail were tons of grasshoppers everywhere that would jump around you as you passed by. Then when you stopped, they would stop too. It was weird. Every single square inch of the desert floor there had grasshoppers in it. I've never seen that many before. And when they jumped up around you, some of them would run into your body and you would feel them. It was very annoying, too annoying to enjoy the petroglyphs on the rocks. I don't know if those grasshoppers were a seasonal thing or not, but there were no signs warning about them. I was glad to be out of Albuquerque. At noon today I drove north toward Los Alamos and was delighted. There was lots to see, more than I thought. 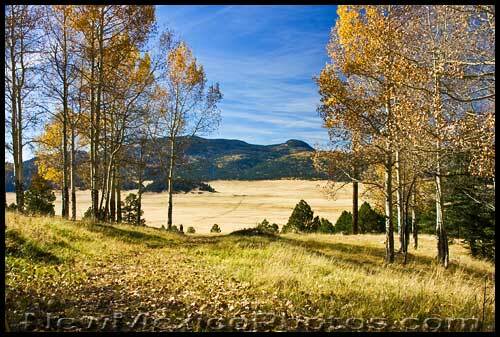 The nature on scenic byway 4 along Jemez Mountain was spectacular. 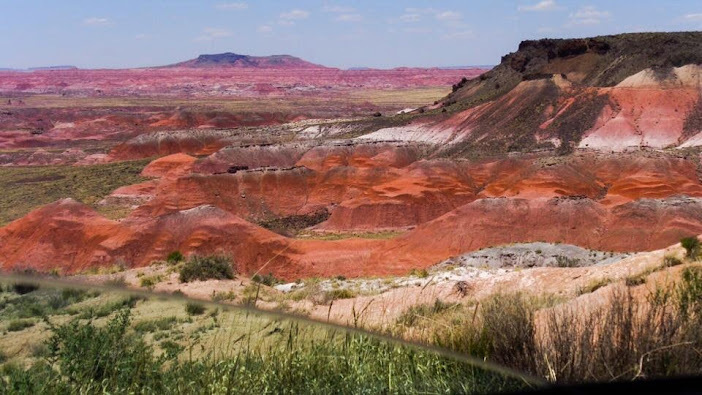 There were red rock canyons, colored mountains and cliffs, forests and hiking trails, fishing spots, Indian ruins, prairie preserves, rivers, waterfalls, scenic vistas, museums, etc. I didn't know there was so much good nature and historical stuff to see around Los Alamos, or on the way there. 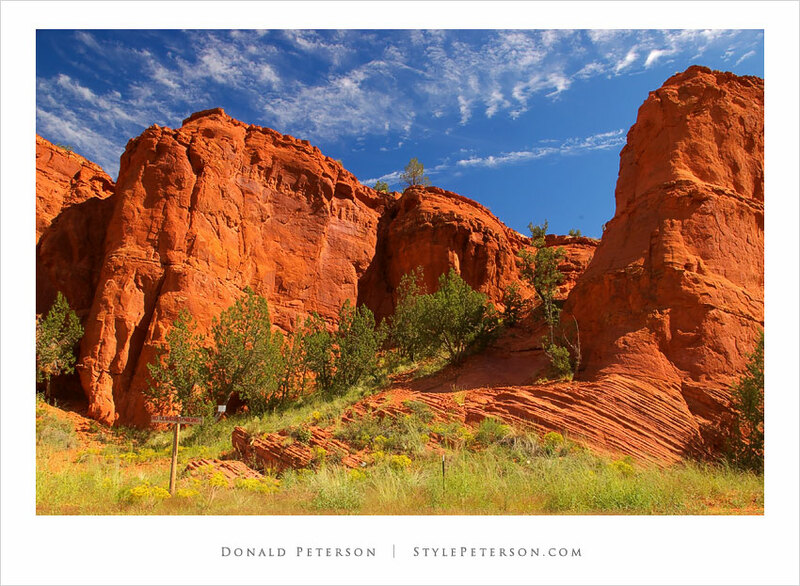 I also didn't know that New Mexico had such nice forests or red rock canyons. I was surprised. I thought that NM was all flat desert with no colors or scenery, which is what I saw in the southern part of the state. But the northern part of the state is different and has more of the spectacular Southwest scenery that nature lovers like. Anyway, I spent so much time hiking, taking pictures, and seeing all the stuff along the way, that by the time I got to Los Alamos, it was already 7pm and nearing sunset. It was too late to see the Bradbury Science Museum. So I checked into a motel. Fortunately, the motel prices in Los Alamos are normal for New Mexico, and fairly cheap. Since the town looked like a piece of Silicon Valley with so many high tech research labs and Ph.D scientists, and had an upper middle class look, I thought that accommodations might be expensive. But they weren't. The town is very safe and controlled, to allow all the important research scientists here to feel safe living here. There is even a little border patrol to monitor or search every vehicle that comes into town. 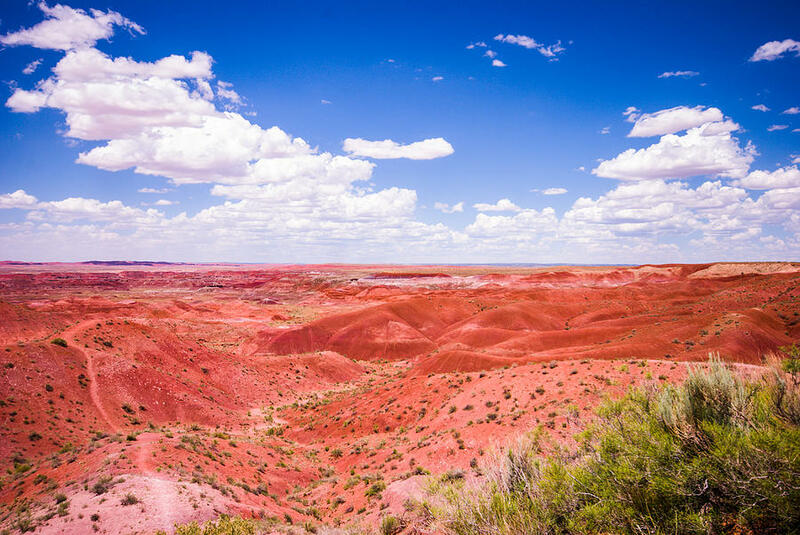 One good thing I've noticed about New Mexico is that almost all the waiters and waitresses that served me so far in restaurants have all tried to have a conversation with me. Some of them even talked to me for a long time. In other US states I've lived in and been too, waiters never try to have a conversation with me. So that aspect is very refreshing. Also, people do seem a lot more down-to-earth and laid back here as well, even more so than in Arizona, but definitely a lot more so than in California or Las Vegas. Businesses are willing to bend rules for you too, which they do not do in California, Washington or Nevada usually. These things are certainly refreshing. Anyhow, there is certainly a lot to see in this area, enough for a whole weekend. So I will be here for two days. Here is a map of the area I'm at, which I highly recommend for nature lovers. 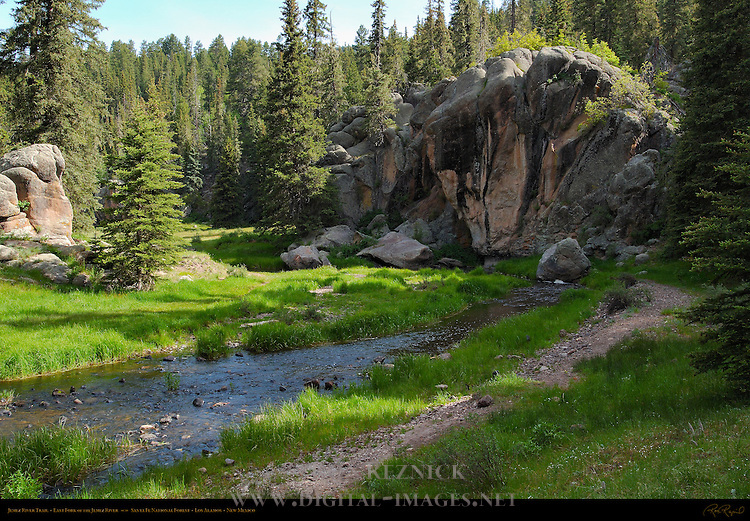 Here are some images from Google of the Jemez Mountains I went through today that represent what I saw (except for the snowy mountain of course, since the snow on it is gone now). This is where I hiked today. It was very nice. The trail by the stream was easy and flat too. I saw this house too. 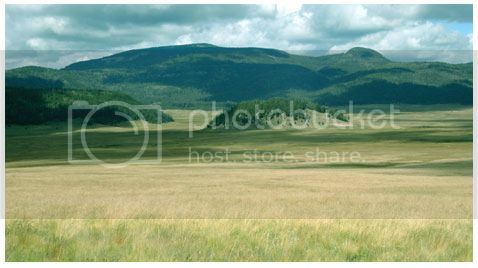 This Valles Caldera Preserve is on the way too. Finally, here is a photo of Los Alamos National Laboratory. It looks top secret. Who knows what they are doing in there. It looks like a nice place to work though, in such a lovely setting. Come on we want to see photos of the grasshoppers!!! in my hotel that once i clicked submit, it did not get posted and then my problem with work started, it was all going fine, as soon as I reached Manila, I'm not sure if i will be able to keep my job anymore. I had booked a long term condo, luckily did not pay the rent. As soon as I stepped in Manila...It has been a nightmare...The invisible force has upped its game and just want to extinguish me now. I had planned it for 5 months and it counts to nothing now and not sure what my next step would be. My indecisiveness has increased 10 fold. you and your space around.. This is a being that eats galaxies for a living. Winston this is a great thread, detailed narrative, beautiful photos. Keep it up! Hi all, I'm in Gallup, NM now. I've been here before, but forgotten that it's a dumpy ghetto town that looks low class with strange vibes that make me feel uneasy for some reason. Plus the train runs through here a lot, which is annoying. After that I headed to Santa Fe for a few days to see some museums and eat at some vegan restaurants and salad bar buffets. There is an Indian cultural museum I would recommend on Museum Hill, away from the downtown area on Old Santa Fe Trail. It's very big and has a lot more Indian artifacts and exhibits than the museums downtown. 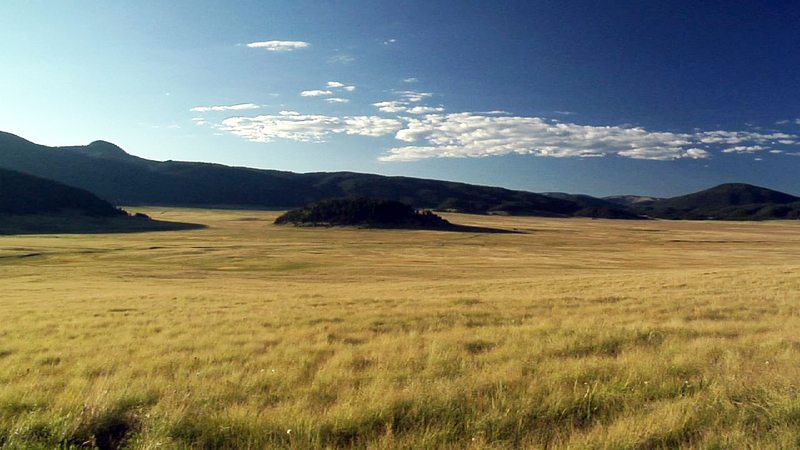 After that, I went back on scenic byway 4 to see Valles Caldera preserve. It turned out that the whole thing is an attraction for geologists because it used to be inside a volcano. The visitor center is sloppily organized, even though their staff are very nice and friendly. Here's the strange thing. This preserve looks very beautiful from afar, but when you enter it, you can only drive up to the visitor center. Then when you enter the visitor center, you are told that the road is closed to the public and cannot drive any further. At that point, most people simply turn back. So how are you supposed to enjoy this preserve or park?! Wtf?! It was only after I did a short hike there, that I found out that there were guided tours there daily, which I asked about before I left. But by then, it was already too late. The last tour left at 4:30pm so I would have to wait til tomorrow. And on the weekends, there are longer more extensive tours. But you don't find out about any of this unless you ask about it. Otherwise, they tell you nothing, except that you can't go any further. And at that point, people simply turn around. Huh?! I mean, if a park has guided tours, shouldn't they be advertised on a sign or billboard in the visitor center? That's basic common sense. Well they are not. And the staff don't mention it either, unless you ask about it. But most people will not ask because they will assume that if they aren't told about it, then it doesn't exist. I mean, what's the point of a visitor center if all they do is tell you to turn back around? Very strange. The other visitors coming in were not told about the tours either. All they were told was that the road was closed to the public from here on. The only way you know about their guided tours is by asking. Otherwise, they don't mention them. But by the time I asked, it was already too late. Had they told me about it when I came in, I would have gone on it. But I didn't want to drive all the way back the next day and delay my trip another day. I plan to contact their administrative office and complain about that. You'd think that a park that gives daily guided tours at set times everyday would mention them in their visitor center. Geez. But the staff don't tell you unless you ask, and there are no signs or billboards about it. I've never seen such a lack of basic organization and common sense. It also defies basic logic -- I mean, why would you sell or offer something, but not advertise it or mention it anywhere? Very odd. Doesn't make sense at all. I guess New Mexico, although laid back, is sloppy and inefficient when it comes to basic things like that. There seems to be a lack of consideration of basic things. It's a poor state with many ghetto towns after all. 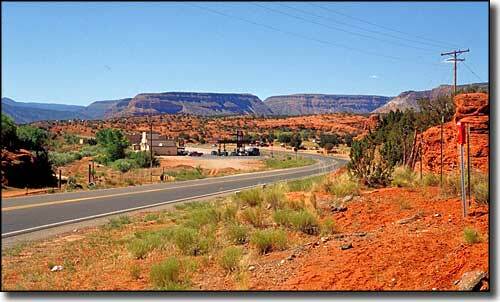 Next, I headed to Chaco Culture Canyon, in the northwest corner of the state and stayed there two days. My friend Mr S recommended it to me. It has the largest concentration of Indian pueblo ruins in the US, and was even featured in the History Channel's Ancient Aliens series. It definitely was very interesting and spectacular. And the ranger program at night in the amphitheater was great. They let us see the surface of the moon through their big telescopes, and the rings on Saturn too. However, Chaco Canyon was very hot, and the way there consists of rough gravel roads that go for many miles, on both ends of the park. There are ridges on those gravel roads, which causes your vehicle to shake up and down a lot. It's not a pleasant ride and is very wearing on your tires. Plus it takes a long time to drive through because you have to drive so slow. I don't get why they don't pave it. I guess no one wants to pay for it. Another thing is that it's out in the middle of nowhere with no gas or food or lodging. So you have to camp there and bring your own food and have plenty of gas. But they do NOT tell you any of that when you head into the park. Again, sloppy inconsiderate management in New Mexico. When you turn off the road to go there, there ought to be a sign telling you that there's no food or gas for many miles. That's something important people need to know. Otherwise, they run the risk of running out of gas there. I entered the park from the northern end. But when I left out of the southern end, I almost ran out of gas. I entered the park with 60 percent of my gas tank full, which I assumed would be enough. But after driving slowly on miles of gravel road (which is very fuel inefficient) and driving the loop in the park several times (with the air conditioning on all the time because it was so hot, which eats up more fuel) I only had half a tank of gas left. And we all know how the second half of the gas tank goes down a lot faster than the first half for some reason. Then when I was leaving the park, I had to go through many miles of gravel road again, which ate up more gas. By the time I got onto the paved road, my gas was low. There was no gas station around. So I headed toward Gallup, NM, which was 55 miles away. With low gas, I wasn't sure if I'd make it. It was very close and getting really low. When I got closer to Interstate 40 though, I finally found some gas stations. It was a relief. What a close call. The problem with driving in New Mexico is that there are long stretches of road with no gas stations for hundreds of miles, but they do not tell you about it like they do in other states. It's very inconsiderate. So if you don't calculate it right, you could run out of gas. That's why I always refill gas here when it's only half full. I'm going to contact the National Park Service and bring these things to their attention. Anyway, I'm in Gallup now, which is in the northwest corner of New Mexico, right next to Arizona. I'm going to rest here for a while and then head to Phoenix. If any of you are down there and want to meet up, let me know. After that, I'll probably go to a Buddhist retreat center for a while to recharge spiritually.